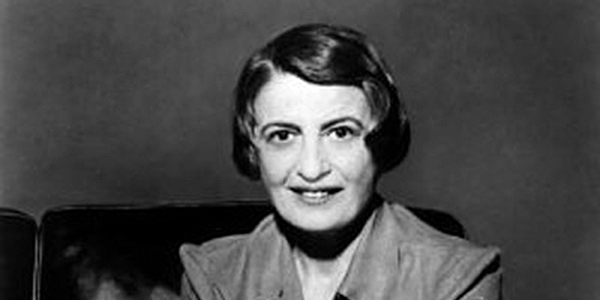 The Article: Ayn Rand USA by Paul Buchheit in AlterNet. The Text: yn Rand’s novel “Atlas Shrugged” fantasizes a world in which anti-government citizens reject taxes and regulations, and “stop the motor” by withdrawing themselves from the system of production. In a perverse twist on the writer’s theme the prediction is coming true. But instead of productive people rejecting taxes, rejected taxes are shutting down productive people. Perhaps Ayn Rand never anticipated the impact of unregulated greed on a productive middle class. Perhaps she never understood the fairness of tax money for public research and infrastructure and security, all of which have contributed to the success of big business. She must have known about the inequality of the pre-Depression years. But she couldn’t have foreseen the concurrent rise in technology and globalization that allowed inequality to surge again, more quickly, in a manner that threatens to put the greediest offenders out of our reach. Ayn Rand’s philosophy suggests that average working people are ‘takers.’ In reality, those in the best position to make money take all they can get, with no scruples about their working class victims, because taking, in the minds of the rich, serves as a model for success. The strategy involves tax avoidance, in numerous forms. Yet as corporate profits surge and taxes plummet, our infrastructure is deteriorating. The American Society of Civil Engineers estimates that $3.63 trillion is needed over the next seven years to make the necessary repairs. Corporations have used numerous and creative means to avoid their tax responsibilities. They have about a year’s worth of profits stashed untaxed overseas. According to the Wall Street Journal, about 60% of their cash is offshore. Yet these corporate ‘persons’ enjoy a foreign earned income exclusion that real U.S. persons don’t get. Corporate tax haven ploys are legendary, with almost 19,000 companies claiming home office space in one building in the low-tax Cayman Islands. But they don’t want to give up their U.S. benefits. Tech companies in 19 tax haven jurisdictions received $18.7 billion in 2011 federal contracts. A lot of smaller companies are legally exempt from taxes. As of 2008, according to IRS data, fully 69% of U.S. corporations were organized as nontaxablebusinesses. There’s much more. Companies call their CEO bonuses “performance pay” to get a lower rate. Private equity firms call fees “capital gains” to get a lower rate. Fast food companies call their lunch menus “intellectual property” to get a lower rate. Prisons and casinos have stooped to the level of calling themselves “real estate investment trusts” (REITs) to gain tax exemptions. Stooping lower yet, Disney and others have added cows and sheep to their greenspace to get a farmland exemption. The IRS estimated that 17 percent of taxes owed were not paid in 2006, leaving an underpayment of $450 billion. The revenue loss from tax havens approaches $450 billion. Subsidies from special deductions, exemptions, exclusions, credits, capital gains, and loopholes are estimated at over $1 trillion. Expenditures overwhelmingly benefit the richest taxpayers. In keeping with Ayn Rand’s assurance that “Money is the barometer of a society’s virtue,” the super-rich are relentless in their quest to make more money by eliminating taxes. Instead of calling their income ‘income,’ they call it “carried interest” or “performance-based earnings” or “deferred pay.” And when they cash in their stock options, they might look up last year’s lowest price, write that in as a purchase date, cash in the concocted profits, and take advantage of the lower capital gains tax rate. So Who Has To Pay? Middle-class families. The $2 trillion in tax losses from underpayments, expenditures, and tax havens costs every middle-class family about $20,000 in community benefits, including health care and education and food and housing. Schoolkids, too. A study of 265 large companies by Citizens for Tax Justice (CTJ) determined that about $14 billion per year in state income taxes was unpaid over three years. That’s approximately equal to the loss of 2012-13 education funding due to budget cuts. And the lowest-income taxpayers make up the difference, based on new data that shows that the Earned Income Tax Credit is the single biggest compliance problem cited by the IRS. The average sentence for cheating with secret offshore financial accounts, according to the Wall Street Journal, is about half as long as in some other types of tax cases. Only 3 percent of the CEOs, upper management, and financial professionals were entrepreneurs in 2005, even though they made up about 60 percent of the richest .1% of Americans. A recent study found that less than 1 percent of all entrepreneurs came from very rich or very poor backgrounds. Job creators come from the middle class. So if the super-rich are not holding the world on their shoulders, what do they do with their money? According to both Marketwatch and economist Edward Wolff, over 90 percent of the assets owned by millionaires are held in a combination of low-risk investments (bonds and cash), personal business accounts, the stock market, and real estate. Ayn Rand’s hero John Galt said, “We are on strike against those who believe that one man must exist for the sake of another.” In his world, Atlas has it easy, with only himself to think about. Well, you know how to write fiction. We should be lucky enough to be living in an Ayn Rand America, economically speaking.